Whiteside is the first major fell on the approaches to Crummock Water and Buttermere from the north, and looms over the Buttermere road, with Whiteside End appearing as a twin of Grasmoor End a little further down the road. Whiteside is impressive from most angles. Its most dramatic feature is also the best hidden - Gasgale Crags, just to the south of the summit ridge, are hidden from sight above the valley of Gasgale Gill and are only really seen from the valley or from the neighbouring fells of Grasmoor, Sand Hill and Hopegill Head. From the west we see the rocky end of the fell, with Whin Ben and Whiteside End dominating. From the north the full length of the summit ridge can be appreciated, and it plays a part in the great view up the Hope Gill valley, forming the western wall of the valley as it builds up to Hopegill Head. The fell has a superb summit ridge, just about one kilometre long, with very little change in altitude from the western end above Lorton to the eastern end facing Hopegill Head. This is a great high level walk, leading to a very rewarding stretch onto Hopegill Head, along a path that looks far worse from a distance than from close-up. 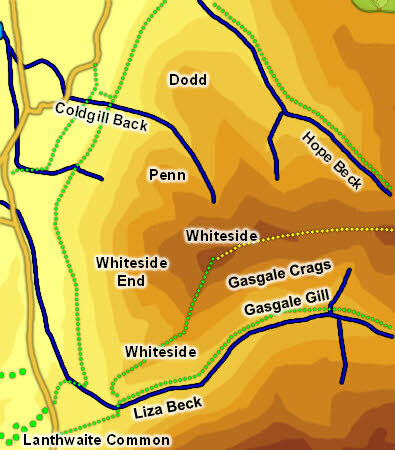 The standard route up Whiteside comes from the west. Starting at Lanthwaite Green a path heads up Whin Ben, the south-western spur of the fell, then climbs up the rocky end of the main summit ridge, emerging at the lower western summit. The fell can also be reached from the east via Hopehill Head, or from the north heading up the ridge that runs behind Dodd. We have an ascent of Whiteside over Whin Ben, returning via Gasgale Gill. Whiteside has three summits spread out along a long ridge, with steep crags to the south and more gentle slopes to the north. The middle of the three is the highest point, the western offers the best views down into Crummock and Lorton, the eastern is on the approach to Hopegill Head. The southern boundary of the fell is formed by Liza Beck, running down the steep sided hidden valley of Gasgale Gill. Once outside the valley the beck turns north and also forms most of the western boundary, before running into the River Cocker at Low Liza Bridge. To the north Hope Beck forms the boundary with Ladyside Pike. It runs into the Cocker at Hopebeck Bridge, three quarters of a mile further north. For that distance the Cocker forms the western boundary of the fell. A number of nameless becks form in Gasgale Crags and run down into the beck. On the northern side Wythe Gill and Cold Gill carry streams down to the Vale of Lorton.